MISH LOVIN' LIFE: It's so cheap we might as well be stealing! We've heard from several people that Koh Samui is far more expensive than other cities in Thailand. But when you've just spent the last 50 days in Europe, this place seems dirt cheap to us! *There I go pimping out The Dizzle again...You're welcome. So you see, this place is basically paradise. An affordable paradise. We'll be here until February 9 if anyone wants to come visit. 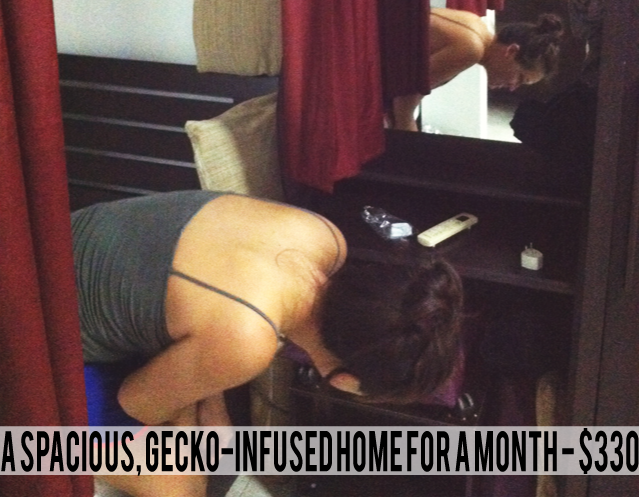 You can stay with us for free if you promise to stay up all night to be on Gecko Watch. Man! I can't wait to GO! I'm ready for two weeks full of lounging by the beach (to watch the tides in case of tsunami of course) and pounds of pad thai. Loving reading up on your time in Thailand so far! Take the Ferry to Koh Tao!! You guys will love it!! 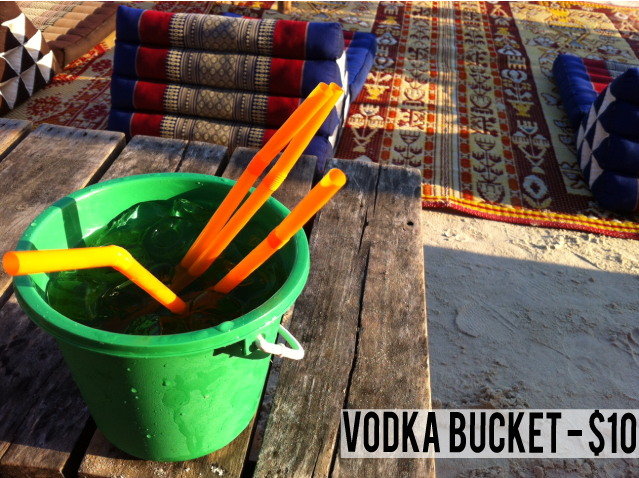 Vodka bucket? Seven dollar massage? I'll be there. Vodka BUCKET? Oh heck yes. And that pad thai looks superb. You had me at Vokda bucket! i'll be RIGHT THERE. order me a vodka bucket. Hahahaha I love the free half naked man watching- that's a definite plus anywhere you go!! V Dizzle is such a good sport for letting you pimp him out! Can you send me some deets on Thailand? Anything you deem useful, pertinent information. 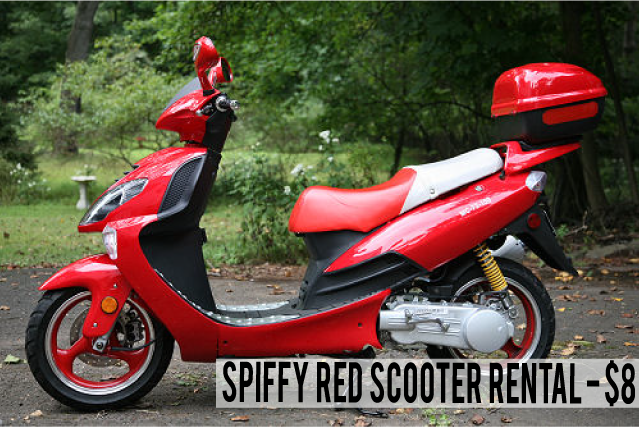 I seriously need to make this happen. What?! You had me at $1.50 pad thai. I would be eating it day and night! Good grief, those prices make me want to hop on a plane and join you! I love the idea of you posting prices of the places you go, I think that would be something I'd love to read about regularly!! 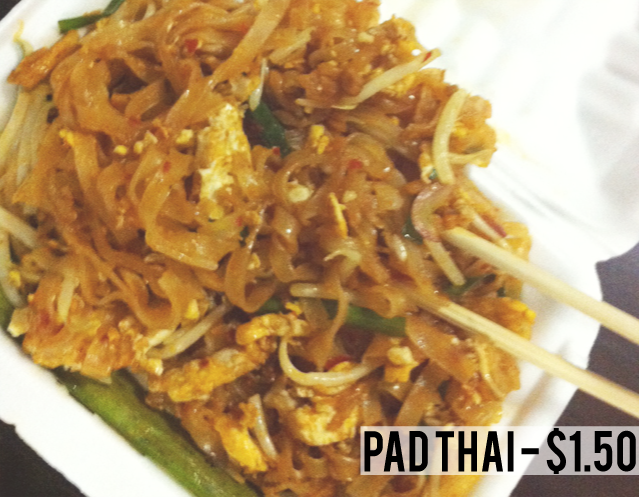 Oh my goodness, pad thai for less than $2.00? WOW! And your home for a month is less than a New York City hotel room for one night, amazing! It really does look like paradise. Why would anyone want to go anywhere else for vacation? oh my gosh, i would be eating pad thai and getting a massage everyday!! I cannot believe you rented a home for a month for $330. That's crazy! You should get a gecko discount, though, for all that emotional trauma. WHAT? Even *I* could afford Thailand! Love this! The massages might be the BEST thing about T! I would go back just for those everyday! Also, those bucket drinks... they will get you, especially if you think you can handle a 2nd...such a bad idea! Have fun!! Make that a whiskey bucket and I'll be there in a flash! Booking my flight. I aint afraid of no gecko. If I didn't like you so much, I would hate you. I cannot believe how affordable and gorgeous this paradise is! Are you ever going to come home? Crying because I'm not there. It snowed here today, just so you know. SNOWED IN BOSTON. I hate you. WTG on europe first and thailand second! imagine if you did it in reverse?? i hear so many good things about traveling in SE Asia. Vodka buckets? im hungover just by looking at the picture! hahah. lmao on free half naked man watch. that dizzle is so stud. OMG $10 VODKA BUCKET?!?!?! I'm SOLD. Yum Pad Thai and whoa $10 vodka BUCKET and Diz shot very GQ with the beautiful background. Thailand is cheap! that's it! I'm going to Thailand before I die! I found you’re blog via Google and I have to say. A Huge Thank you very much, I believed your post was extremely enlightening. I simply couldn’t leave your website before asking suggestions for Koh Samui real estate. I will revisit to see what response I can receive here.